One of the highest-ranking intelligence officials in the U.S. government, retired Adm. Michael Rogers stepped down last spring from dual duty as head of U.S. Cyber Command and the National Security Agency after a 37-year career. Under his 4-year tenure as chief, Rogers helped elevate Cyber Command to the status of combatant command — one of only 10 such senior-most operational units in the Defense Department and the first in more 25 years to achieve that designation. At NSA, he helped restructure and realign the agency to meet rapidly evolving 21st-century challenges. 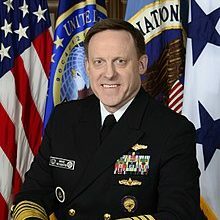 “In the past few years, NSA has seen significant challenges and given the deep changes in the world both technologically and in the capabilities of its target sets in the post-9/11 era, NSA executed its largest fundamental organizational changes in nearly 20 years,” Rogers said. “It is never easy to ask a team to fundamentally change the way they work and are organized, particularly when most of the team has only known one approach or structure in their professional lives but they have done and are continuing to do just that and I remain incredibly grateful for their willingness to do so,” he added. For decades, Rogers has been at the forefront of many of the government’s most critical missions and has seen firsthand the benefits and challenges of technology. Rogers points to a few key trends: the explosion of data — including acquisition, processing and protection and the ability to generate meaningful and relevant data from it; the importance of accessing networks and understanding them in a fast and efficient manner; and the need to continually optimize and refresh the skills and abilities of the tech-based workforce. After more than 30 years in government, including in the highest echelons of the intelligence community, what’s next for Rogers? Well, for the first time in decades, he won’t have to be in the office, in uniform, before the sun rises, “nor will I have the joy of working with the men and women who serve this nation as part of the DoD and the U.S. intelligence structure,” he said. “But on the other hand, I won’t be at work every day at 05:00 and I won’t be shaving every day!” Rogers added. Professionally, Rogers says he’ll spend 2019 focusing on supporting teams in the private sector whose missions he believes in and that provide value to society.